SQL Server Developer is responsible for the creation, maintenance and support of database in organizations. 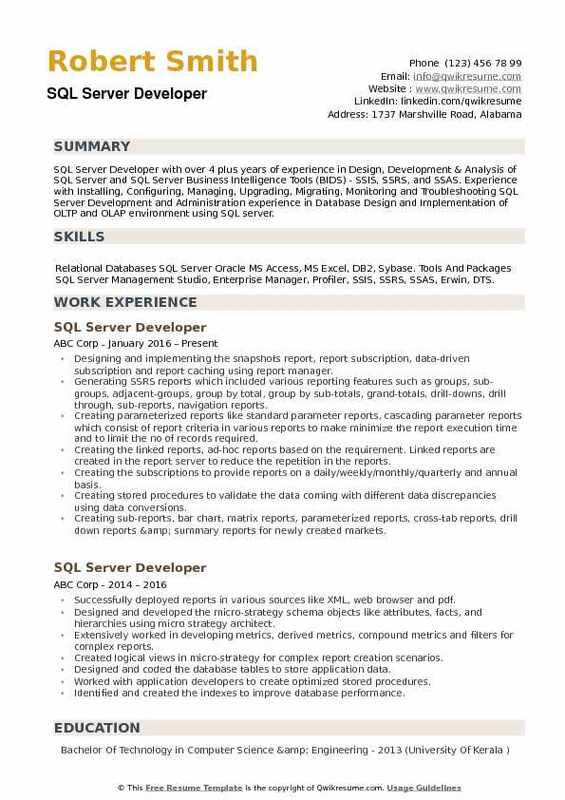 The roles and responsibilities underlined in the job description template are importing client data into the database and exporting data back to the client, designing a relational data warehouse for business intelligence, designing complex queries like stored procedures, triggers, functions to support processes and maintaining the system integrations. 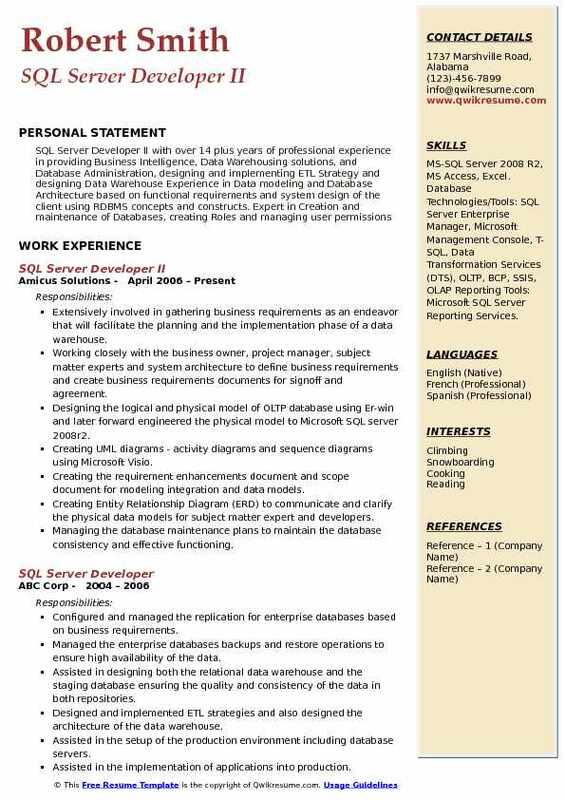 The SQL Server Developer Resume also highlights duties like performing quality checks, keeping track of changes, reviewing developmental code and providing the users with data required for metrics and analysis. There are other responsibilities like performing testing and troubleshooting and documenting database architecture codes and user instructions. The skills required are knowledge of management system, complex programming languages, and project accounting. The individual should have good knowledge of RDBMS, working knowledge of windows forms is an added advantage. The educational qualification required is a degree in computer science or equivalent. Summary : Senior SQL Server Developer with 10 plus years of experience in professional application and database development with thorough knowledge of different phases of software development lifecycle including analysis, design, development, documentation, deployment and system support. Experience in designing of the database in SQL Server 2012, 2008, 2005 and 2000. Hands on experience in writing T-SQL queries, Stored Procedures, User Defined Functions (UDF), Cursors, Derived Tables, Views, and Triggers. 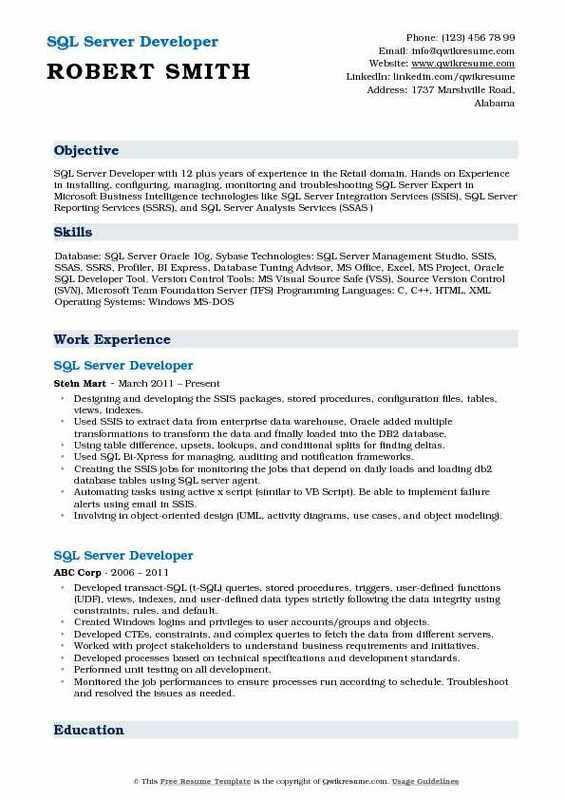 Skills : SSIS/SQL 2005/2008 R2, ActiveBatch V9, ERWIN 8 Data Modeling Tool, XML Schema, FTP,BIDS, Visual Studio2010. Working with client/business analysts to define data requirements for enterprise analytical reporting needs. Designing and developing the automated routines (scripts etc.) to facilitate the application development and deployment process. Maintaining DB schema and code change management using TFS and Redgates SQL compare. Maintaining the product application data which is critical in product lifecycle and efficiently implementing the data migration in each release. Implementing the heartbeat product role-based security which defines access to each individual functionality based on their role-based permissions. Involving in database design, application development of health benefits functionality and developed mission-critical benefits eligibility exception report. Developing SQL routines for complex, enterprise-level application development tasks involving hierarchical tree structures. 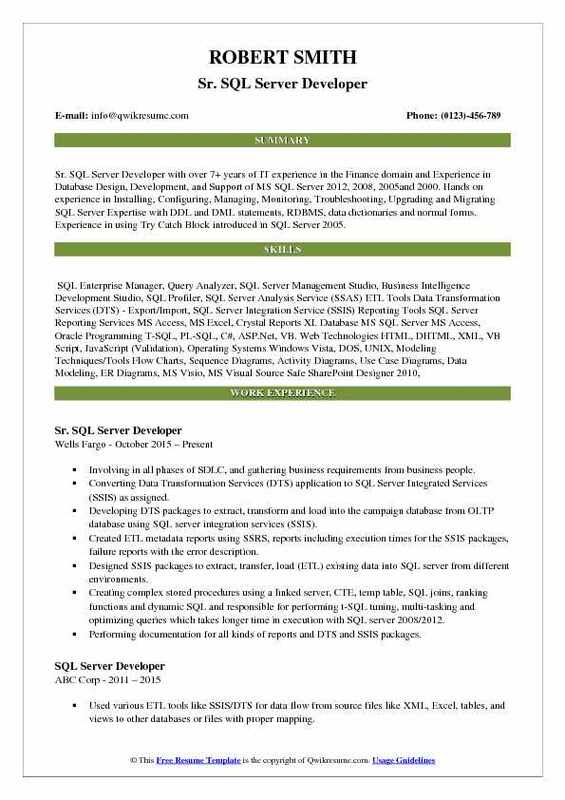 Headline : Sr. SQL Server Developer with 6 plus of experience in the Finance domain. Experience in Database Design, Development, and maintenance of database applications on SQL Server in OLTP/OLAP/BI environment. Installation and configuration of SQL Server Management Studio 2008 R2, Experience in writing complex SQL queries involving multiple tables inner and outer joins. Extensive experience in writing Transact-SQL (DDL/DML) queries. Working on full life cycle development (SDLC) involving in all stages of development. Creating the database objects - schemas, tables, indexes, views, user-defined functions, cursors, triggers, stored procedure, constraints, and roles. Writing the stored procedures and user-defined scalar functions (UDFS) to be used in the SSIS packages and SQL scripts. Extensively utilizing the joins and sub-queries to streamline complex questions including different table. Developing the tabular queries for efficient analysis of report using pivot/unpivot in T-SQL. Creating and managing the clustered indexes and non clustered indexes and optimized queries using execution plan. Creating action filters, parameters and calculating the sets for preparing dashboards and worksheets in Tableau‬‬. Creating dimension model for reporting system by identifying required dimensions and facts using Erwin. 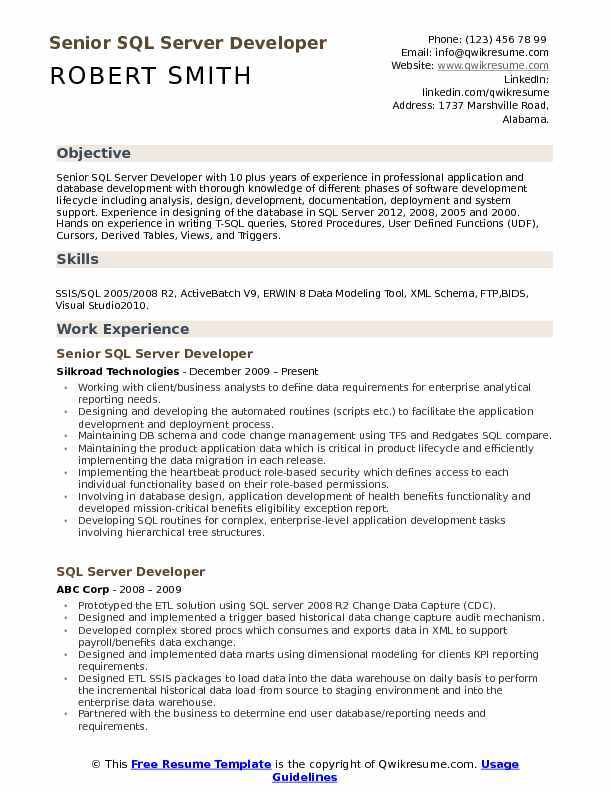 Summary : Sr. SQL Server Developer with over 7+ years of IT experience in the Finance domain and Experience in Database Design, Development, and Support of MS SQL Server 2012, 2008, 2005and 2000. Hands on experience in Installing, Configuring, Managing, Monitoring, Troubleshooting, Upgrading and Migrating SQL Server Expertise with DDL and DML statements, RDBMS, data dictionaries and normal forms. Experience in using Try Catch Block introduced in SQL Server 2005. Involving in all phases of SDLC, and gathering business requirements from business people. Converting Data Transformation Services (DTS) application to SQL Server Integrated Services (SSIS) as assigned. Developing DTS packages to extract, transform and load into the campaign database from OLTP database using SQL server integration services (SSIS). Created ETL metadata reports using SSRS, reports including execution times for the SSIS packages, failure reports with the error description. Designed SSIS packages to extract, transfer, load (ETL) existing data into SQL server from different environments. Creating complex stored procedures using a linked server, CTE, temp table, SQL joins, ranking functions and dynamic SQL and responsible for performing t-SQL tuning, multi-tasking and optimizing queries which takes longer time in execution with SQL server 2008/2012. Performing documentation for all kinds of reports and DTS and SSIS packages. 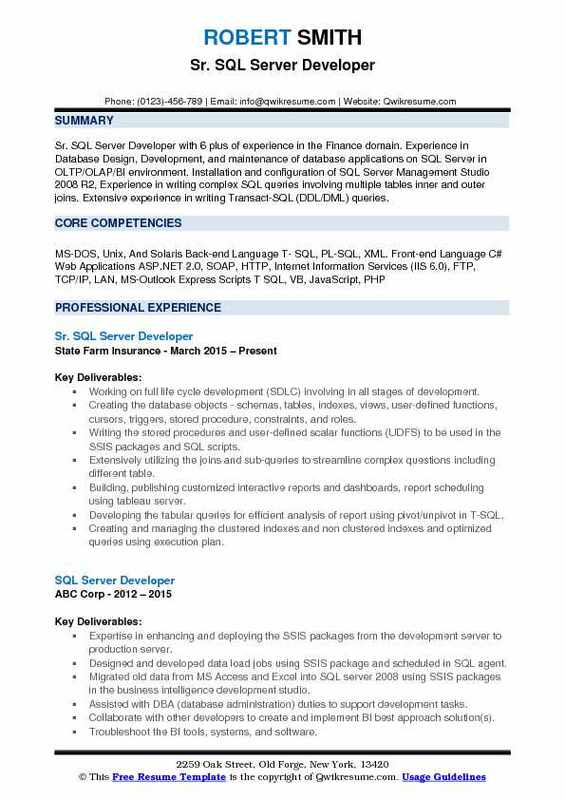 Summary : SQL Server Developer I with over 12+ Years of IT experience in the Healthcare domain which includes System Analysis and Design, Development & Support of MS SQL Servers Comprehensive knowledge and exposure to different phases of Software Development Life Cycle (SDLC). Experience in Software Analysis, Design, Development, Testing, Implementation and Production, support of Client/Server and Web-based applications. Worked extensively with SSIS to import, export and transform the data between the linked servers. Involving in business analysis and technical design sessions with business and technical staff to develop entity-relationship/data models, requirements document, and ETL specifications. Creating the database objects like procedures, functions, packages, triggers, indexes, and views using t-SQL in development and production environment for SQL server 2005. Using DDL and DML for writing triggers, stored procedures, and data manipulation. Creating database and database objects like tables, stored procedures, views, triggers, rules, defaults, user-defined data types, and functions. Involving in unit testing, user acceptance testing to check whether the data is loading into the target, which was extracted from different source systems according to the user requirements. Generated database SQL scripts and deployed databases including installation and configuration. Objective : Junior SQL Server Developer with over 3 plus years of IT Experience in Database Design, Development and business intelligence of Microsoft SQL Server in Development, Test and Production Environments. Expertise in writing T-SQL Queries using joins, Sub queries and Cursors in MS SQL Server Strong hands-on experience with MS SQL Server with Business Intelligence in SQL Server Reporting Services, SQL Server Analysis Services of and SQL Server Integration Services. Working on various possible performance-related issues including database tuning with the sole intention of achieving faster response times and better throughput. Involving in the analysis of report design requirements and actively participating and interacting with team lead, technical manager and lead business analyst to understand the business requirements. Migrated DTS packages from SQL Server 2000 to SQL server 2012 as SSIS packages. Experience in working on cube structure optimization for MDX query performance in analysis services 2008. Excellent report creation skills using Microsoft SQL server 2012/2008r2 reporting services (SSRS) with proficiency in using report designer as well as report builder. Created SQL server reports based on the requirements using SSRS 2008. Worked on the reports module of the project as a developer on ms SQL server 2012 (using SSRS, t-SQL, scripts, stored procedures, and views). Developed complex stored procedures, views, and temporary tables as per the requirement. Designing and developing the SSIS packages, stored procedures, configuration files, tables, views, indexes. Used SSIS to extract data from enterprise data warehouse, Oracle added multiple transformations to transform the data and finally loaded into the DB2 database. Using table difference, upsets, lookups, and conditional splits for finding deltas. Used SQL Bi-Xpress for managing, auditing and notification frameworks. Creating the SSIS jobs for monitoring the jobs that depend on daily loads and loading db2 database tables using SQL server agent. Automating tasks using active x script (similar to VB Script). Be able to implement failure alerts using email in SSIS. Involving in object-oriented design (UML, activity diagrams, use cases, and object modeling). Involved to develop the VB script, C#, and ASP.Net, VB.Net and dot Net framework creation in SSAS and SSIS. 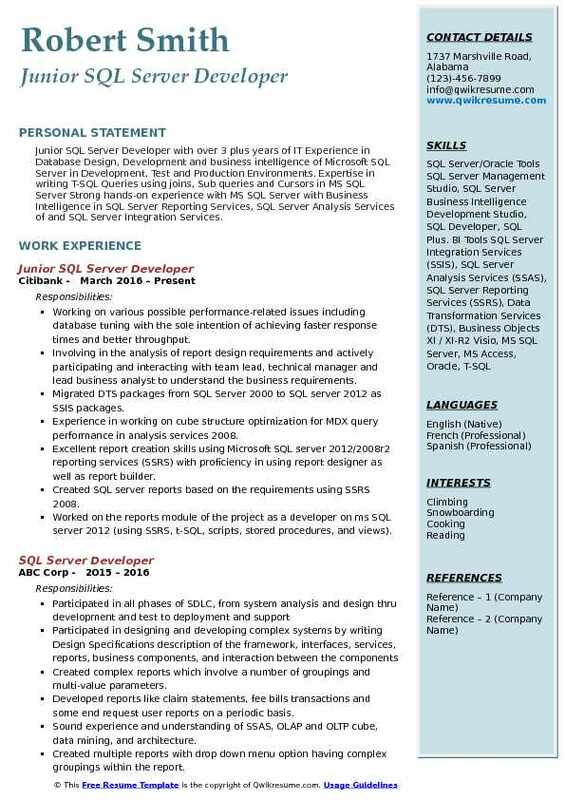 Summary : SQL Server Developer (SSIS/SSRS) with around 8 years of IT experience in the Analysis, Design, Development, Administering Client/server application using Microsoft SQL Server and BI suite (Development, UAT and Production Environment). Good knowledge of software development lifecycle and significant experience with object-oriented analysis and design methodologies. Very good knowledge with T-SQL (DDL and DML) statements, RDBMS, data dictionaries. Performed server installation and configuration using SQL server 2012. Designing, implementing and maintaining the database schema, entity relationship diagrams, data modeling, tables, stored procedures, functions and triggers, constraints, indexes, functions, views, rules, defaults and complex SQL statements. Maintaining the database schema in source code control (MS team suite database edition preferred). Developing the SQL programs and involved in optimize stored procedures and queries for faster retrieval and server efficiency SSAS and SSIS. Using the quality center (defect tracking tool) for bug fixing and resolution details. Involving in mock testing and unit testing and integration testing in SSIS, SSAS. Creating the automated stored procedures for day end operations using SQL server agent and CTE. Coordinating with the front-end for implementing logic in stored procedures and functions. 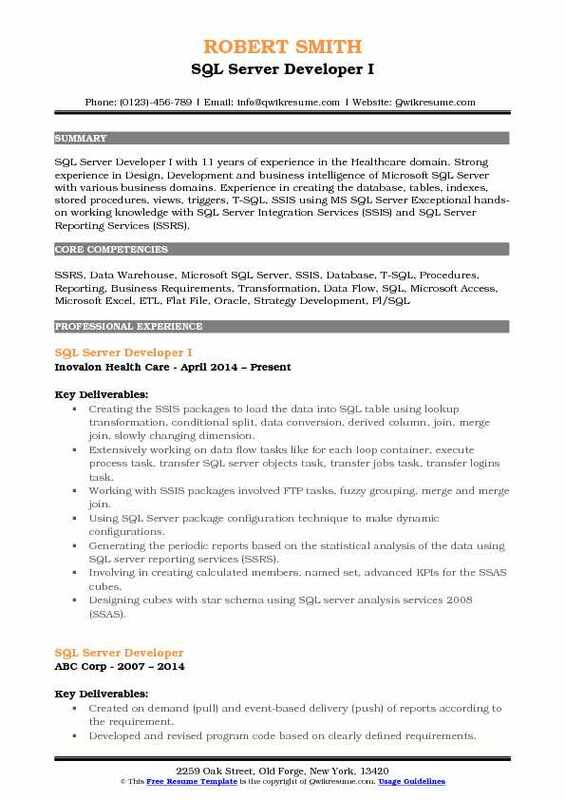 Summary : SQL Server Developer I with 11 years of experience in the Healthcare domain. Strong experience in Design, Development and business intelligence of Microsoft SQL Server with various business domains. Experience in creating the database, tables, indexes, stored procedures, views, triggers, T-SQL, SSIS using MS SQL Server Exceptional hands-on working knowledge with SQL Server Integration Services (SSIS) and SQL Server Reporting Services (SSRS). Creating the SSIS packages to load the data into SQL table using lookup transformation, conditional split, data conversion, derived column, join, merge join, slowly changing dimension. Extensively working on data flow tasks like for each loop container, execute process task, transfer SQL server objects task, transfer jobs task, transfer logins task. Working with SSIS packages involved FTP tasks, fuzzy grouping, merge and merge join. Using SQL Server package configuration technique to make dynamic configurations. Generating the periodic reports based on the statistical analysis of the data using SQL server reporting services (SSRS). Involving in creating calculated members, named set, advanced KPIs for the SSAS cubes. Designing cubes with star schema using SQL server analysis services 2008 (SSAS). Creating several dashboards and scorecards with key performance indicators (KPI) in SQL server 2005 analysis services (SSAS). Skills : MS-SQL Server 2008 R2, MS Access, Excel. Database Technologies/Tools: SQL Server Enterprise Manager, Microsoft Management Console, T-SQL, Data Transformation Services (DTS), OLTP, BCP, SSIS, OLAP Reporting Tools: Microsoft SQL Server Reporting Services. Extensively involved in gathering business requirements as an endeavor that will facilitate the planning and the implementation phase of a data warehouse. Working closely with the business owner, project manager, subject matter experts and system architecture to define business requirements and create business requirements documents for signoff and agreement. Designing the logical and physical model of OLTP database using Er-win and later forward engineered the physical model to Microsoft SQL server 2008r2. Creating UML diagrams - activity diagrams and sequence diagrams using Microsoft Visio. Creating the requirement enhancements document and scope document for modeling integration and data models. Creating Entity Relationship Diagram (ERD) to communicate and clarify the physical data models for subject matter expert and developers. Managing the database maintenance plans to maintain the database consistency and effective functioning. 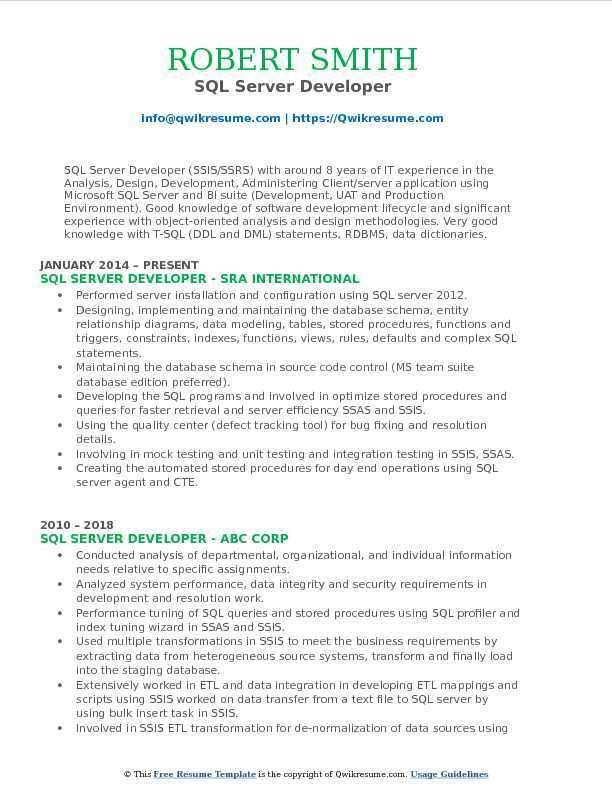 Objective : SQL Server Developer with over 4 plus years of experience in Design, Development & Analysis of SQL Server and SQL Server Business Intelligence Tools (BIDS) - SSIS, SSRS, and SSAS. Experience with Installing, Configuring, Managing, Upgrading, Migrating, Monitoring and Troubleshooting SQL Server Development and Administration experience in Database Design and Implementation of OLTP and OLAP environment using SQL server. 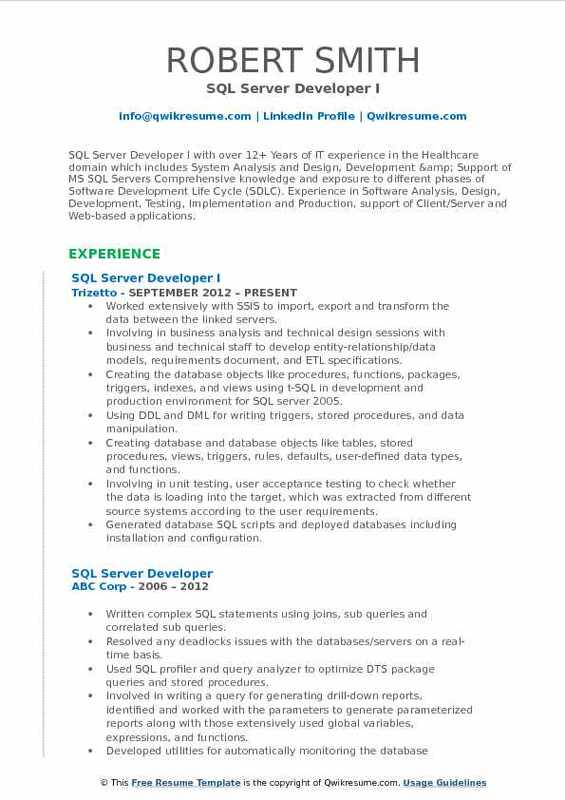 Skills : Relational Databases SQL Server Oracle MS Access, MS Excel, DB2, Sybase. Tools And Packages SQL Server Management Studio, Enterprise Manager, Profiler, SSIS, SSRS, SSAS, Erwin, DTS. Designing and implementing the snapshots report, report subscription, data-driven subscription and report caching using report manager. Generating SSRS reports which included various reporting features such as groups, sub-groups, adjacent-groups, group by total, group by sub-totals, grand-totals, drill-downs, drill through, sub-reports, navigation reports. Creating parameterized reports like standard parameter reports, cascading parameter reports which consist of report criteria in various reports to make minimize the report execution time and to limit the no of records required. Creating the linked reports, ad-hoc reports based on the requirement. Linked reports are created in the report server to reduce the repetition in the reports. Creating the subscriptions to provide reports on a daily/weekly/monthly/quarterly and annual basis. Creating stored procedures to validate the data coming with different data discrepancies using data conversions. Creating sub-reports, bar chart, matrix reports, parameterized reports, cross-tab reports, drill down reports & summary reports for newly created markets.